Radoslaw Sikorski received the "Knight of Freedom" award for initiating the process of creating the concept of the Eastern Partnership in the framework of the European Neighbourhood Policy of the EU, the aim of which is to bring pro-European values and help in carrying out reforms in the partner states. He graduated from Oxford University in the fields of philosophy, political science and economics. In March of 1981 he was chairman of the Student Strike Committee during the Bydgoszcz events. In the years 1981-1989 he stayed in Britain as a political refugee. From 1986 to 1989 he worked as a reporter during the wars in Afghanistan and Angola. In 1992 he held the position of deputy minister of national defense. In 1998-2001 he held the position of undersecretary of state at the Ministry of Foreign Affairs and Chairman of the Foundation for Assistance to Poles in the East. 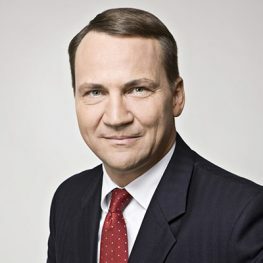 In 2005-2007, Sikorski held the office of Minister of National Defence and in the years 2007-2014 foreign minister.